Punxsutawney Phil may have gotten it wrong this year but Spring has finally sprung! Officially, the first day of Spring arrived back on March 20th. However, based on the grey sky and chilling weather in southeastern Pennsylvania, we weren’t sure that Mother Nature had gotten the message. Even Punxsutawney Phil got it wrong this year on Groundhog Day! Back on February 2nd, Phil failed to see his shadow, which was supposed to signal an early spring … unfortunately, it turned out to be just the opposite as Spring was at least a month late this year. But finally in the last few days, I am thrilled to report that there is real evidence that Spring has finally spring in Valley Forge. The temperatures starting climbing and actually hit the mid-80’s! But the real signal to the arrival of Spring in this part of country is the blooming daffodils and the bright yellow forsythia bushes. People, plants and animals are starting to emerge from their winter mode, stepping outside, blooming and otherwise welcoming the sunshine. 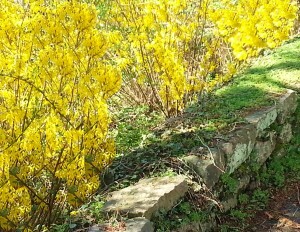 Isn’t it amazing how much better you feel with the sights and smells of Spring! 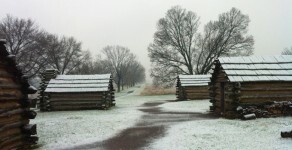 This is the perfect time of the year to visit Valley Forge National Historic Park, less than 10 minutes from the Great Valley House. The Park has 3,000 acres and 26 miles of walking and hiking trails! The Great Valley House of Valley Forge has a very historic past, all the way back to the late 1600’s, but don’t let our age fool you, we offer you all of the modern conveniences you expect at a first class establishment. Whether you are looking for a quiet getaway spot, vacationing in the historic Valley Forge area, college visiting at Villanova University, Bryn Mawr or Haverford College or on a business trip to the area, join us and enjoy a special and relaxing experience. Historic farmhouses of the past were often filled with warm and vibrant families. To honor the best of yesterday, our overnight guest rooms are named in honor of special men who touched our lives and left their memory on the Great Valley House. We take you back to the prime of their lives where each faced triumphs and struggles with strength and honor. These early owners were caring and hospitable, inviting many guests to their own homes and tables. We carry on their fine traditions and invite you to Relax ~ Breathe ~ Create!